SNITZEL (AUS) (Bay 2002-Stud 2006). 7 wins-4 at 2, MRC Oakleigh P., Gr.1. Second on Aust. Sire List 2013-14. Sire of 708 rnrs, 494 wnrs, 59 SW, inc. Shamus Award (MVRC WS Cox P., Gr.1), Hot Snitzel, Sweet Idea, Sizzling, Snitzerland, Russian Revolution, Summer Passage, Wandjina, Invader, Heavenly Blue, Spill the Beans, Time for War, Flying Snitzel, Farson, Perignon, French Emotion, Salade, Chance Bye, Amorino, Redzel, Young Man Power, etc. Looks Like the Cat (g. by Husson). 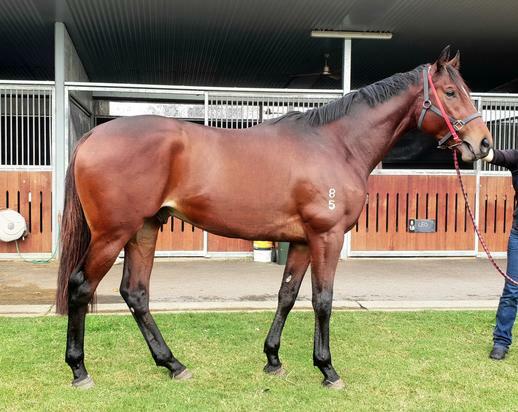 Winner at 2, A$209,500, HK$516,350, BRC XXXX Gold 2YO H., 2d VRC Danehill S., Gr.2, BRC Champagne Classic, Gr.2, MRC Caulfield Guineas Prelude, Gr.3, HKJC Cotton Tree H., 3d BRC JJ Atkins S., Gr.1, Sires' Produce S., Gr.2, HKJC King Kwong H.
Murtle Miss (f. by Murtajill). 4 wins to 1550m, BRC Sequalo at Lyndhurst H., 3d BRC Mount Franklin P., Channel Seven P., Hidden Dragon at Lyndhurst P.
Silent Stash (f. by Dash for Cash). 2 wins at 1050m, 1400m, SAJC Camp Quality H.
Fraar Jester (f. by Murtajill). Placed at 3 in 2016-17 in Aust. SILENT SURROUND (Face Value). 3 wins-2 at 2-from 1200m to 1950m, A$308,930, SAJC Sires' Produce S., Gr.3, Hayden Engineering 2YO P., CA Haigh & WH Wylie Memorial H., 2d VRC Wakeful S., Gr.2, SAJC Tokyo City Cup, L, Spring Racing at Morphettville H., Allan Scott Park Morphettville 2YO H., Adelaide Casino H., 3d VRC Edward Manifold S., Gr.2, Balaklava Cup, L, SAJC Fav4 at Sportingbet.com.au H., 4th MVRC JRA Cup, Gr.3, SAJC Spring S., Gr.3. Fiery Dee. 3 wins. See above. Goldent. Winner at 1050m in Aust. STATION HAND (Rancher). 7 wins from 1200m to 2000m, A$557,990, VATC TS Carlyon Cup, Gr.2, VRC Rising Stars H., MVRC St V's Graduates H., Nearco H., SAJC Atropine H., 2d VRC Australian Cup, Gr.1, Blamey S., Gr.2, VATC Memsie S., Gr.2, MVRC Waterford Crystal Mile H., Gr.3, 3d VRC Australian Cup, Gr.1, MVRC WS Cox P., Gr.1, VRC Chester Manifold S., L, 4th STC BMW S., Gr.1, VRC Blamey S., Gr.2. Mountain Champ. 5 wins at 1000m, 1400m, HKJC Sha Kok H., Carnation H., Yunnan P., Fo Tan H.
Biography. 2 wins. See above. MR SANDGROPER (Peintre Celebre). 7 wins from 1200m to 2400m, A$534,160, WATC Derby, Gr.1, WATC Melvista S., L, Challenge S., L, Tony McManus H., Swell Baby H., WA Week Blue Spec H., Thorium H., 2d WATC Railway S., Gr.1, York S., L, ATA H., Cruisers Yachts Australia H., 3d WATC Lee Steere S., Gr.2, Acropolis H., Wabasso H., 4th WATC Fruit 'n' Veg S., Gr.1, JC Roberts S., L.
My Life. 2 wins at 1450m, 2000m, 2d VATC Our Faith H., 3d VATC Highways Tabaret H., VRC Show Ego H., MVRC Strathayr H. Producer. Vicki Anne. 6 wins from 1200m to 2100m to 2015-16, ARC Golf & Turf H., South Auckland Racing Club Cup, Matamata RC Matamata Mitre 10 H., 2d ARC Thomsons Foodservice H., Auckland Co-Op Taxis H., 3d Avondale JC Ritchies Coachlines H., Marton JC John Turkington Forestry H.
Surpassing (More Than Ready). 6 wins-1 at 2-from 1000m to 1600m, A$96,405, 2d ATC Lake Moore H., 3d Gold Coast Bracelet, L.
Zenshin. Winner at 1400m in Aust. Producer.